Are any among you suffering? They should pray. Are any cheerful? They should sing songs of praise. Are any among you sick? They should call for the elders of the church and have them pray over them, anointing them with oil in the name of the Lord. The prayer of faith will save the sick, and the Lord will raise them up; and anyone who has committed sins will be forgiven. Therefore confess your sins to one another, and pray for one another, so that you may be healed. 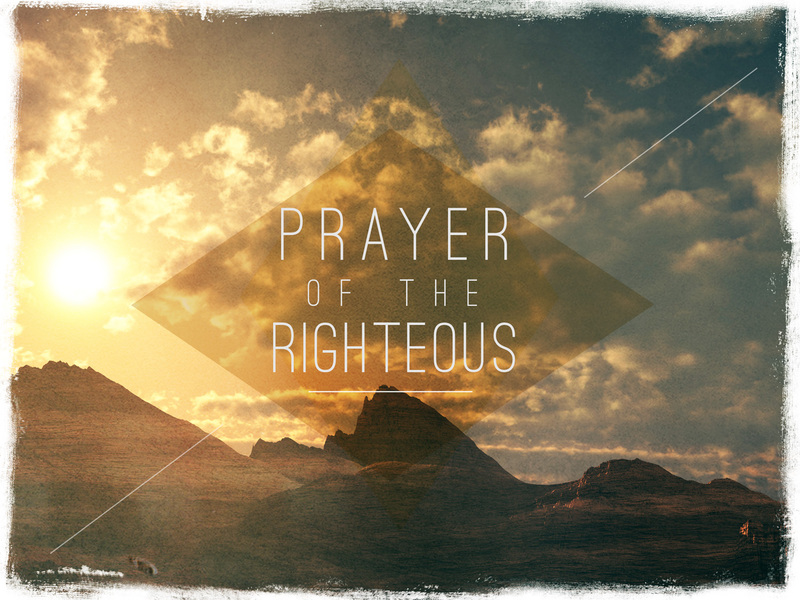 The prayer of the righteous is powerful and effective. Elijah was a human being like us, and he prayed fervently that it might not rain, and for three years and six months it did not rain on the earth. Then he prayed again, and the heaven gave rain and the earth yielded its harvest. My brothers and sisters, if anyone among you wanders from the truth and is brought back by another, you should know that whoever brings back a sinner from wandering will save the sinner’s soul from death and will cover a multitude of sins. Sunday morning: 11am. The gathered community of faith was sitting patiently in the pews waiting for the worship service to begin. Week after week the people sat in the same pews with the same expressions on their faces. Year after year they listened to preachers come and go telling the same stories about Jesus from different perspectives. It was just like every other Sunday morning. Mr. Smith sat all the way up on the right hand side in the front pew with his notebook and pen in hand ready to take notes on whatever he heard. Jimmy, John, and Josh were midway back on the left quietly giggling while drawing stick figure battles all over the bulletin. And Miss Ethel, old and frail, was still slowly making her way up the center aisle while the first hymn was being played. Worship is repetitive; for nearly two millennia Christians have gathered once a week to say the same prayers, hear the same stories, and sing the same songs. Worship is just like any good habit, and the longer you have it, the more fruitful it will become. The congregation sat attentively while the pastor preached on the power of prayer. The seasoned Christians had heard sermons like this one before; they could almost imagine how the preacher would tie it together before he even spoke the words. The newer Christians were getting a little tired of hearing about prayer week after week, they wondered about when the pastor would call for them to lead a revolution to turn the world upside-down, they wanted to hear about power, not about prayer. And the youth, bless their hearts, if you had called their names from the pulpit in the middle of the service they would have looked up with bug-eyed expressions as if their teacher had singled them out in the middle of class. The preacher was getting to what he imagined was the pinnacle of his proclamation, the words were flowing accordingly, and he no longer needed to look at his notes to drive the point home. As he stood up in the pulpit, gazing out over his gathered flock, he lifted up his fist for the final paragraph and froze in mid-sentence when he saw Miss Ethel slowly slump over in her pew having taken her final breath on earth. When are we supposed to pray? James would have us pray all the time. Are any among you suffering? They should pray. Are any cheerful? They should sing songs of praise. Are any among you sick? They should call for the elders of the church and have them pray over them, anointing them with oil in the name of the Lord. No matter what is going on in life, whether we’re on a mountaintop of joy, or in the bottom of a valley of sorrow, we should pray. We pray in celebration and in defeat, we pray during the mundane, and we pray during the extraordinary. We should pray all the time. Prayers of deep faith will bring about salvation on earth. The Lord will raise us up. Through prayer, any sin can be forgiven. We should confess our sins to other people, and pray for others to be healed. Righteous prayers are powerful and effective. Elijah was just like us, and he prayed for a drought for three years and it did not rain, and as soon as he prayed for the rain to fall, it did. If anyone begins to wander away from faithful life, we do well to reach out and bring them back out of love. So, then why is prayer such a last resort for many of us? James clearly outlines that if Christians do anything, they should pray. As individuals and as a community we are defined by the fact that we believe in relying on something bigger than ourselves being active in the world. Yet, more often than not, Christianity has been compartmentalized into just having a personal relationship with Jesus Christ (something you can do without the church). But having a personal relationship with Jesus Christ, though wonderful, is not what Jesus wants from us. Instead, we are called to be people of prayer who live like Jesus in community with our brothers and sisters in faith. 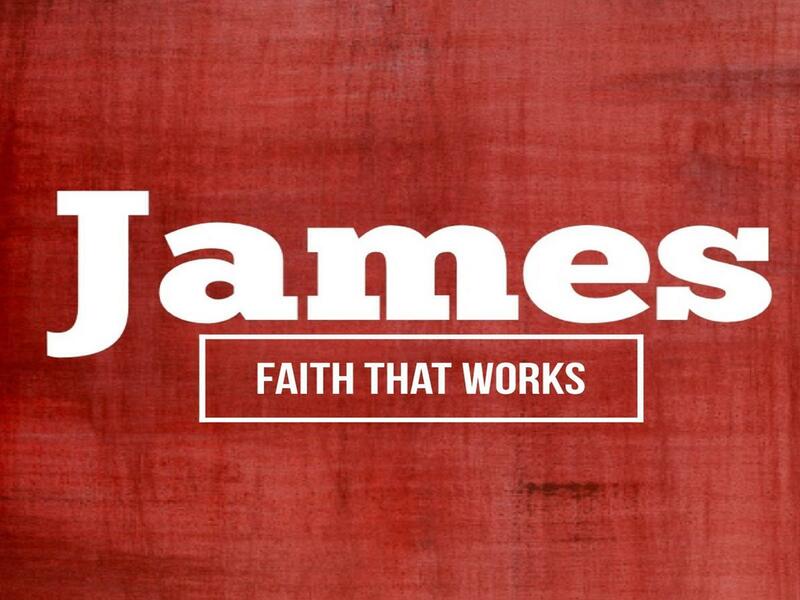 James clearly outlines what prayer can accomplish: it keeps us humble when life is full of success, and it keeps us hopeful when life is full of disappointment; it encourages us to open our eyes to the ways God is moving in the world, and it encourages us to be active participants in God’s kingdom here on earth. Prayer is about relationship; it’s about connecting with God through the people around us. The pastor stood in the pulpit and did not know what to do. He was trying desperately to string the final thoughts of his sermon together when Ms. Ethel fell over in her pew and died. He could feel all the eyes in the sanctuary look from her pew, to him in the pulpit, expecting him to do something. But he panicked and froze. This was not something they covered in seminary, there was no class on ministering to the dead in the middle of a worship service, so the pastor stood in the pulpit and stared back at the church. One of the ushers immediately called the rescue squad, but the rest of the church slowly stood up from their pews and began to gather around Ms. Ethel’s pew. No directions were offered, no specific pages of the hymnal were referenced, but as if God’s was orchestrating the entire thing, the congregation gathered around her lifeless body and began to pray and sing. The words of faith came pouring from their mouths, thanksgivings were uttered, and intercessions were demanded. The great songs like Amazing Grace and How Great Thou Art were sung and hummed by the church. And by the time the ambulance had taken Ms. Ethel away, the pastor and the entire church were holding each other in tears of pain and joy, recognizing the loss of life while acknowledging the hope of the resurrection. When asked later about the moment of prayer, the parishioners simply explained that in the midst of something so profound, the only thing they could do was pray. Prayer can be beautiful, but it can also be uncomfortable. We don’t like having to wrestle with our finitude, we don’t like having to admit that one day we will die, that’s why weddings are much more crowded than funerals. But prayer, done rightly, is the most faithful thing we can ever do as Christians. If James had it his way, we would spend more of our time confessing our sins to our fellow Christians. Talk about uncomfortable. When I encouraged all of you to take time to walk up to the pulpit and proclaim your sins, I did so in jest, but it would make us a more faithful community. Look around the room: you all are beautiful. On the surface you’ve got the right outfits and dispositions. But on the inside, everyone is facing a battle that they rarely share with anyone else. It is a mistake to assume that we are eager to surrender our privacy to the church, but imagine (if you can) what it would be like if we trusted each other enough to do so. If we could find just one person to confess to, we would make ourselves vulnerable and ready for healing. Confession is the beginning of transformation. How are we, as a church, shaped by prayer? Worship is structured around prayer. We pray for God’s presence to be made known to us in this place on Sunday mornings. We pray collectively for the world toward the beginning of the service. We pray silently from our pews lifting up our own joys and concerns. We pray for the offering that is collected by the ushers. We pray through the hymns we sing and the creeds we confess. The best sermons we hear are the ones less about our lives and more like prayers offered to and about God. And we end worship with a prayer. In addition to worship we pray before our bible studies and youth meetings. We pray before every committee and before the church council. 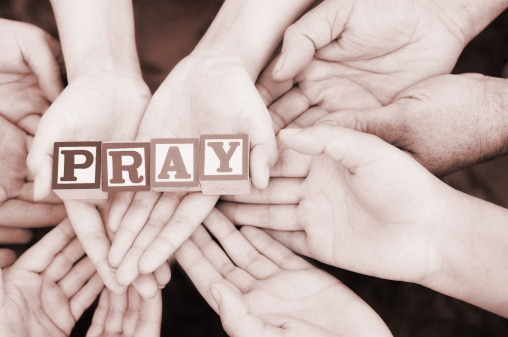 We are a people of prayer… but are we being shaped by prayer? We are now going to try something that will probably make us uncomfortable. In a few moments I will ask us to find someone else in church and ask for their prayers. We tried this on Wednesday night at The Circle meeting and it was a challenge. I asked for the youth to give me just one thing that I could pray for regarding their lives. Immediately I heard about friends or family members that needed prayer, but that wasn’t what I was talking about. I asked, “How can I pray for you right now?” and I want each of us to ask that same question right now. So, as your able, I encourage you to find someone else in the church, you don’t have to wander too far, but find someone that is not in your immediate family. Once we’ve paired up, I want both people to take an opportunity to share something they need prayers for. This doesn’t have to be an ultimate confessional moment, maybe the thing you need is more patience with your children, perhaps you feel confused about decision and you could use some discernment, or maybe you’re unsure about what God is doing in your life. Whatever that thing is I want you to share it, and the person who hears it will pray about it. The prayer can be as simple as “Lord, in your mercy, hear our prayer.” Or it can be filled with other words. The point is, I want everyone in this church to have the opportunity to share a need they have, and have someone in this church pray for them right away. I know this is uncomfortable, but sometimes the most faithful things we do as disciples are born out of discomfort. So, let’s give it a try…. In the words of James: Are any of us suffering? We should pray. Are any of us filled with joy? We should sing songs of praise. Are any of us sick? We should call for our brothers and sisters in Christ to come and pray over us. We should confess our sins to one another, and pray for one another, so that we may be healed and transformed. Amen. This entry was posted in New Testament and tagged Community, Confess, Hold, Hope, James, Jesus, Listen, Love, New Testament, Prayer, Preaching, Righteousness, Salvation, Sermon, Worship. Bookmark the permalink.